Address: Pakistan Testing Service Headquarter, 3rd Floor, Adeel Plaza, Fazal-e-Haq Road, Blue Area, Islamabad. Get PSO Management Trainee Program 2018 PTS Registration Online | www.pts.org.pk Download Test Pattern / Syllabus. Pakistan State Oil is the oil market leader and largest company in Pakistan and currently it is seeking to hire dynamic and career-oriented professionals on training assignment who are willing to meet challenges and make a difference in the organization. 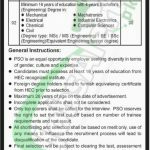 PSO invites application for a one-year training program and there are total 60 positions are available in different fields such as Marketing, Human Resources, Supply Chain, Law, Management Sciences, Accounting / Finance, Computer Science, Mechanical, Electrical, Chemical, Civil, Industrial Electronics, Mechatronics & Computer Sciences. Candidates from all over Pakistan are welcome to apply but they should possess relevant qualification and experience as per the criteria mentioned in the following image such as Candidates must possess at least 16 years of education with 04 years Bachelors from HEC recognized institute and maximum 26 years of age on the date of advertisement. So, only suitable candidates meeting criteria should apply as per the following how to apply procedure given below. Candidates must possess at least 16 years of education with 4 years Bachelors Degree in MBA/BBA/BS/LLB/LLM/MSc/MS (Engineering)/BE/BSc (Engineering) is required to apply from HEC recognized institute. Foreign degree holders need to furnish equivalency certificate from HEC prior to selection. Maximum 26 years of age is required on the date of advertisement. Candidates have to submit Rs. 130/- as test fee in favor of PTS. The last date for submission of application is November 05, 2018. Candidates already in Government / Autonomous Bodies / Semi-autonomous Bodies should forward their applications through proper channel. Information about PTS Test Schedule and Roll Number will be dispatched to PTS official site. Only qualified candidates from written test will be allowed to appear for an interview. For more quality jobs please stay in touch with us at JobsAlert.pk. Last Date to Apply: November 05, 2018.